As a musician, a guitar nut, and a recording artist, I’m always exploring different things to get different sounds. I’m always trying out strings, picks, pickups, electronics, and much more… always looking to see what something sounds like or feels like. So, what do we feel about our strings? It seems as though every musician with whom I speak has a completely different view of their strings. It’s truly amazing. Musicians, from pro to novice, all express divergent views on their strings. And yet others are somewhere in between. What’s right? The right answer is, if the strings do what you want, then they’re the right ones. So, enough about the philosophy of strings… let’s talk about a particular brand and type… I’ll write more reviews about other brands and types down the road a bit. Today, I’m going to ramble about D’Addario XL strings. There are lots of kinds of excellent D’Addario strings. Read more about them and browse them at zZounds. I like zZounds – they’ve been great for me as a customer. First of all, I love these. They’re super-consistent quality. I’ve opened, installed, and played hundreds of sets of D’Addario XL guitar and bass strings – and I’ve NEVER had one with a bend, a “funny place”, or with a largely unreliable sound. D’Addario strings, in general, are extremely consistent and extremely reliable. I’ve never had one break. I’ve never had one “go dull” on me before the rest of the set. I’ve never had one feel strange when I’m playing. The quality is good and consistent. Here’s one of the main things about strings… how do they sound? Not all strings are the same manufacture, not all strings sound the same, and not all strings are musical in the same way. 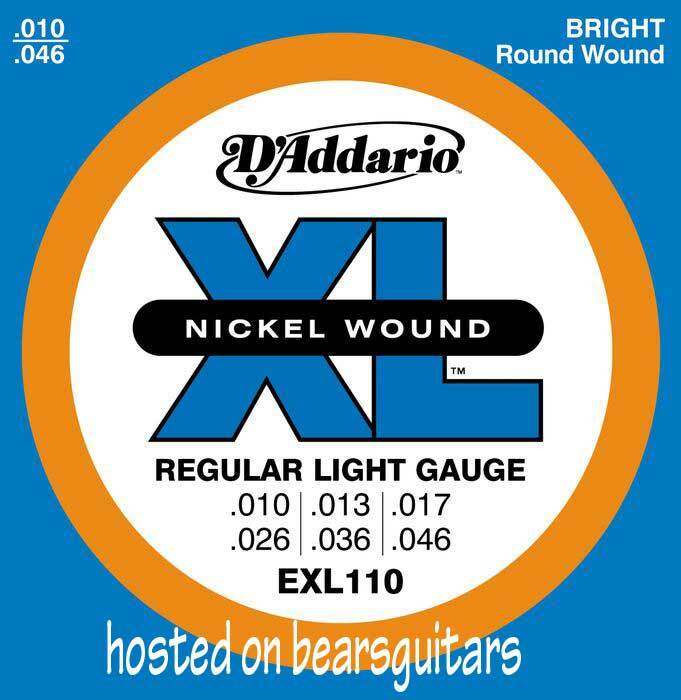 D’Addario XLs sound generally bright, whether you’re playing nickel-plate, pure nickel, or acoustic brass/bronze strings. They have a nice growl to them that sounds like freshly wound metal – very nice. I’ve played strings from other manufacturers – strings bearing virtually the exact same specs as the XLs I’ve played. In general, the D’Addarios growl a little more, sing a little more, and produce a mellow tone when played easy on clean. D’Addario XLs are generally priced within a half-dollar of all of its competitors. I don’t feel that D’Addario XLs are expensive or cheap – they seem priced just right… I feel as though they are the “workhorse” type of string – a brand and type musicians can count on. D’Addario XLs last a fairly long time. There are other brands and types I’ve used that stay close to “fresh” feel and sound longer than the XLs I play, but not many. I have also played brands (brands that I DO like, mind you) that don’t last nearly as long. In general, D’Addario XLs seem to last well past average, and are consistently in the top range of long-lasting uncoated strings. I love D’Addarios. I install them on customer’s guitars very frequently. I have a couple of guitars that get nothing but D’Addario XLs (generally 10s). I REALLY like the phosphor-bronze sets I use on my Ibanez acoustic. I love the quality and the general sound of them. I like the multi-pack options to save some coin, and I like the way they feel even up to the time when they start to get grimy. They’re great strings. Give them a try. This entry was posted in Accessories Review and tagged accessories, d'addario, gear, review, string by Jim of Vivid Peace. Bookmark the permalink. What does “XL” and “EXL” stand for, and what does the number after them mean? For instance, EXL 110, EXL 115, etc. 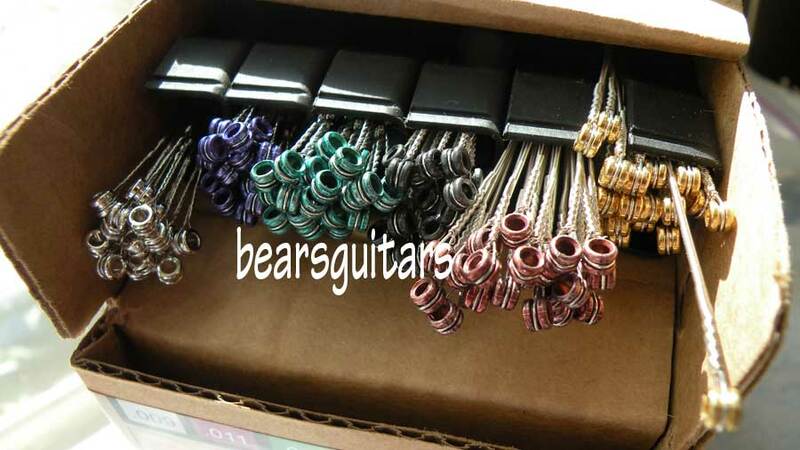 EXL-110 is an “XL” set that is for electrics Strings from .010 to .046, a 6 string set. D’Addario has a huge array of string products, so there isn’t always a direct comparison from the item number to the name. I love their products and use them on many guitars. If you want to see what the model/item numbers are really about, go here: http://daddario.com. When I’m looking for strings, I’ll do searches for “electric coated .010 earnie” or “electric coated .010 d’addario”, etc. That helps me find coated strings that have .010 in the set for either Earnie Ball or D’Addario (just to name two).